I have an unknown device that DOES NOT have a DEV or VEN, I’ve checked, double checked re-read the string of relevant numbers and letters several times got my better half to check AND THEY ARE NOT THERE. Export the relevant key upload it to this domain but with /filez/ on the end. Then post just the file name here. my name is Bruno Banelli and I am the author of PCI-Z. 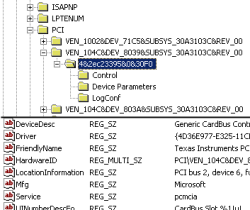 PCI-Z is a system utility based on the idea of lspci and PCI ID Repository used by lspci. It is 100% small portable freeware tool for serving basic purpose of lspci functionality on Linux – showing PCI devices names without drivers in both GUI and CLI. Since your article seems to address the main issue why I created PCI-Z, I wanted to share information about it with you.